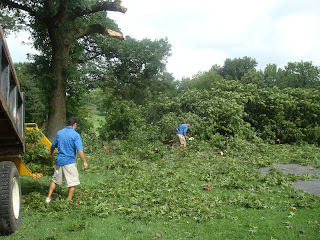 Sorry for the delay in posting this blog regarding the storm damage we experienced Saturday night at the course but things have been a little busy cleaning up the mess. There have been stronger storms to run through our area but when I arrived at the club Sunday morning preparing to shape up the course for member play, I realized very quickly we had a pretty significant clean up task ahead. The staff went about trying to get the course set up for member play. Junk had to blow from every green and tee, holes were changed and greens were mowed. I began preparing saws which would help us begin the clean up. Once the guys got the initial jobs completed, it was time to tackle our biggest obstacle. 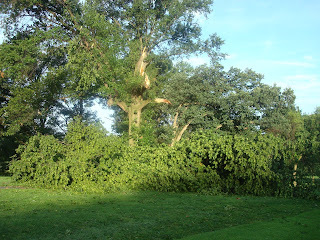 The large oak at the top of the hill on the right side of #3 green had snapped off at about 25' in the air landing on the path and stretched out almost to the fairway. 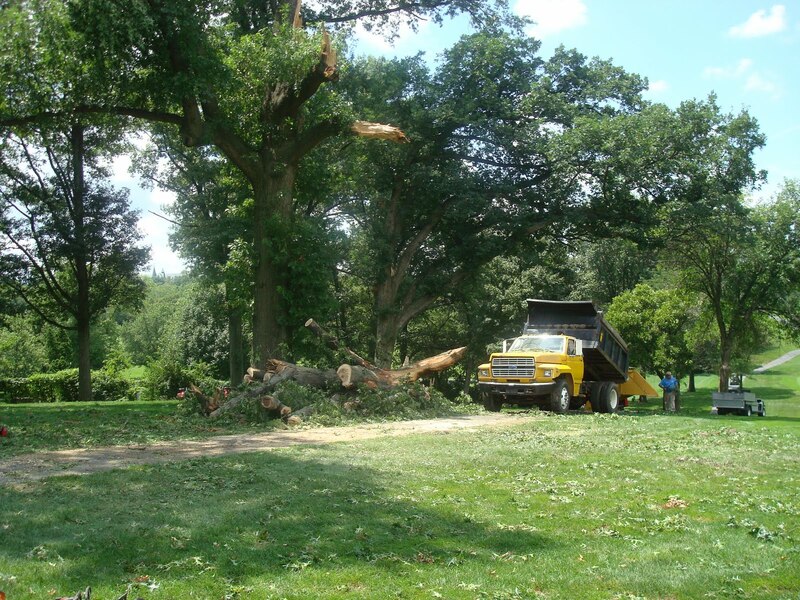 Once the oak was sufficiently cleared away from the area, the fairways had dried enough from the rainfall to begin blowing off the debris that were strewn across the fairways and into the rough where the small material would be ground up by the rough mowers. The rest of the brush and sticks would have to be picked up by the staff over the next few days. Another large oak next to the property line near #12/4 teeing area lost a significant side which fell onto the fence and into the cemetery. 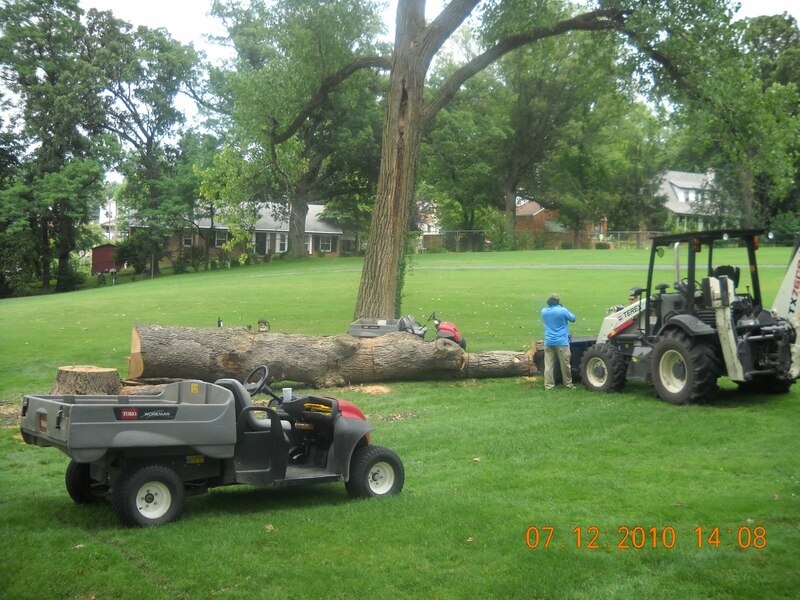 A large oak in the club lawn snapped at the base and a few other small trees were toppled over on property. Trees limbs of all shapes and sizes littered the roughs. Along with the clean up came more rain which has now pushed us to 5.18" of rain since July 18th which has placed us behind in our mowing and other work on the course but with a few dry days we should hopefully begin to catch up a little. This rain also has come at a time when some pretty intense heat and humidity continues to place some severe stress on our greens. It appears that almost the complete top half of the tree fell to the ground. The tree is lying across the cart path and almost reached the fairway. Russ sawing and Tom L. pulling branches to the chipper. It was like a jungle going into the tree. The braches were heavily covered in leaves which were wet from the evening before's rainfall. You knew you were going to get wet from sweat anyway so you just had to dive in and get it over with. Tom M. doing the chipping of the ash tree just below the oak which a large limb ripped off. We pushed the pile of logs over to the side so the cart path was cleared and the boys could go home for the day. This was at 2:00 p.m. on Sunday. We also wanted to get out of the way of our members and guests who had to listen to our chipping and grinding all morning long. 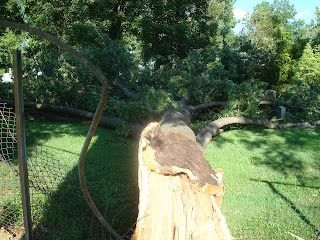 This side limb of the tree is about 2 feet in diameter. A pretty massive limb. A majority of the damage has been picked up except for the tree along the cemetery. 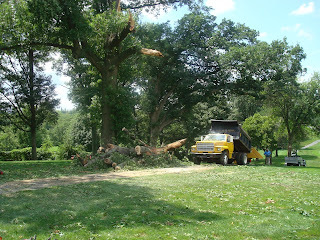 We've chipped at least 4 dump truck loads of debris from this storm which will be utilized on the course next season. 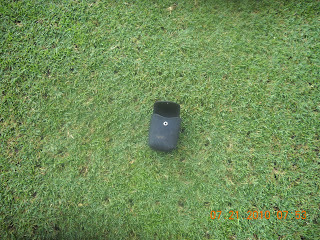 Our fairway aeration started out on a promising note but ended with a thud a little after noon on Monday. 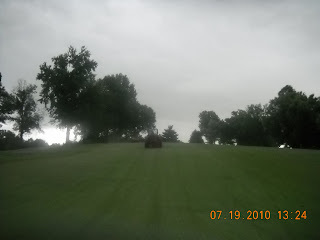 We were able to complete two fairways, #1 and #13 and got to the point of mowing #15 when the rain started. We thought we had until afternoon before the rains came but a storm popped up in the south and delayed any further work for 2 hours after we had aerated #1. Once the storm skirted by to the west, we began to aerate #13. We completed #13 and was in the process of finishing the dragging of #15's cores when the rains came out of the north. #15 still has some clean up remaining but is playable. 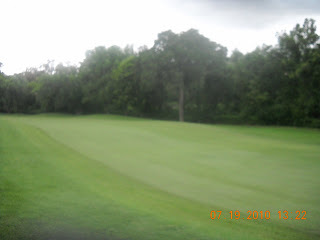 Rain on Tuesday and overnight has delayed any efforts at getting the fairway mowed and cleared of debris. 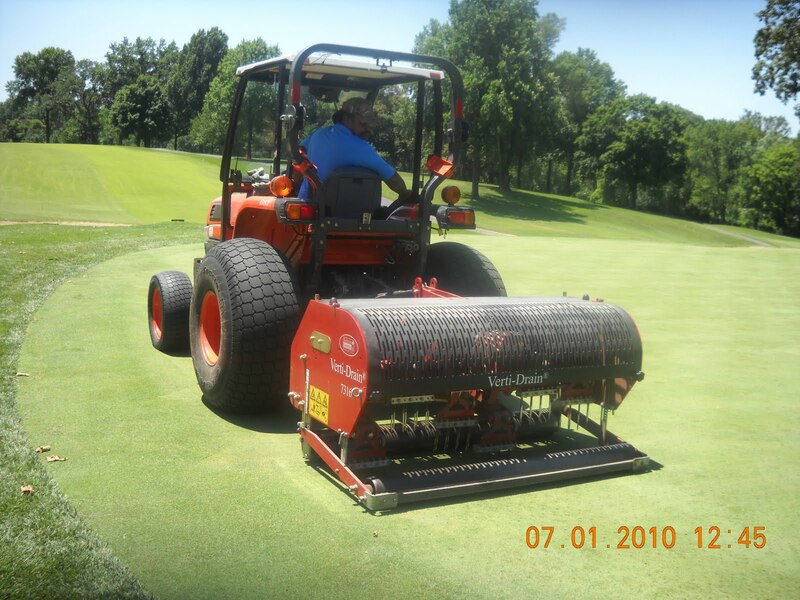 The aeration of our fairways has a number of benefits. 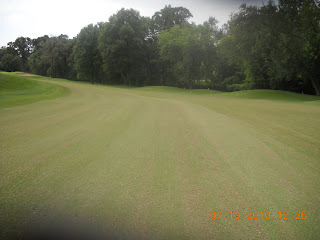 Reduces compaction to our zoysia which do not thrive in compacted soil. Compacted soils do not allow water to penetrate into the soil which would require irrigation to be used on a more frequent basis. The holes help water penetrate more deeply into the soil until the soil is to the saturation point. The small reservoirs made by the aeration holes provide a quick inlet for water penetration. Reduces surface moisture which allow carts to be off trails much more quickly after a rain event and provides for a better playing surface. Reduces thatch that can build up in areas encouraging disease, reducing water penetration and tying up nutrients. 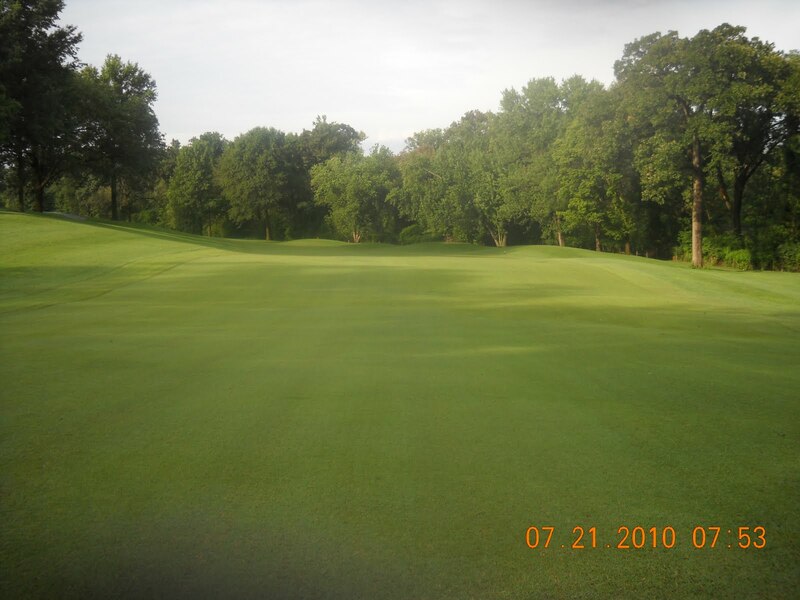 Improves zoysia rooting and allows for more oxygen to penetrate into the soil. 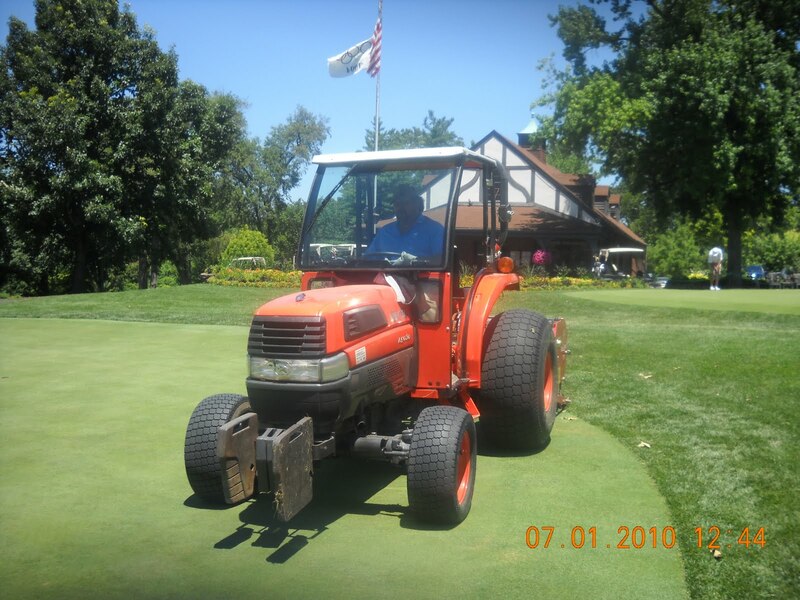 Excessive rain and an equipment malfunction will delay our aeration until Monday, July 26th. 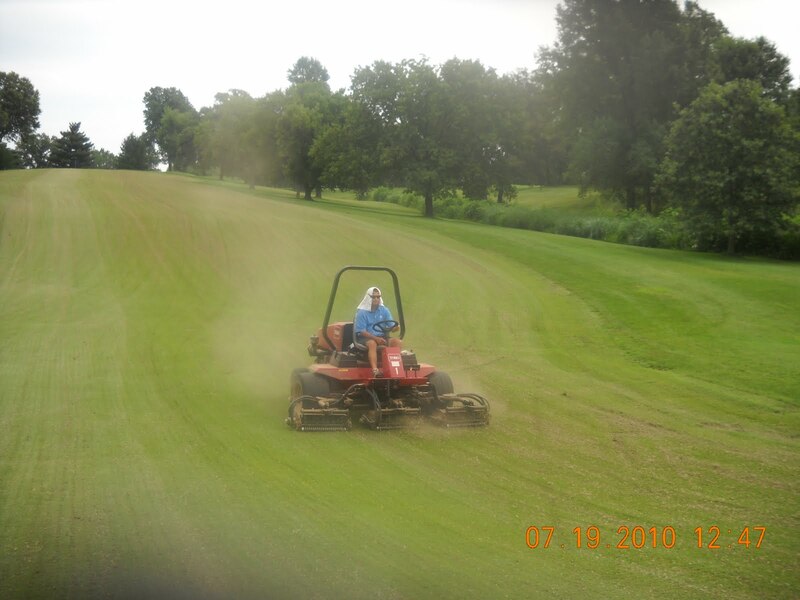 I would expect that we will have a couple of additional fairways to complete on Tuesday, July 27th. I've got a couple of pictures to share with you regarding our operation. I did fail to take a picture of the actual aerator working but I do have a link to last years video that I made of the aerator in action. Cores are pulled by the aerator and then we take a metal drag with pallets laid on top of it for weight and drag the cores to break them up. We then take our fairway unit and mow the fairway because the turf has been forced to stand up and there is still some cores that did not break completely. This is a very dirty job as you can see Russ has a towel over his head and glasses on to protect his eyes. When the material gets very dry, you usually have to wear a dust mask around your face as well. Once the material is mowed, it looks like the picture below. A lot of clipping and some dust and dirt from the cores that have been broken apart. Skip and Tom are double teaming the 13th fairway with our blowers before the rain arrives. Rain was beginning to fall when they completed the fairway. The view of #1 after the fairway has been aerated, cores broken apart, mowed and blown free of debris. #1 Fairway 2 days later. The view looking down upon the newly completed #1 fairway. The spacing is about 3" apart to a depth of about 3". I would expect the holes to be completely covered by turf within this week. The 8th tee was mowed with the riding tee mower this morning for the first time at our standard 1/2" height of cut. It has held up well over the play it has received during the Invitational. 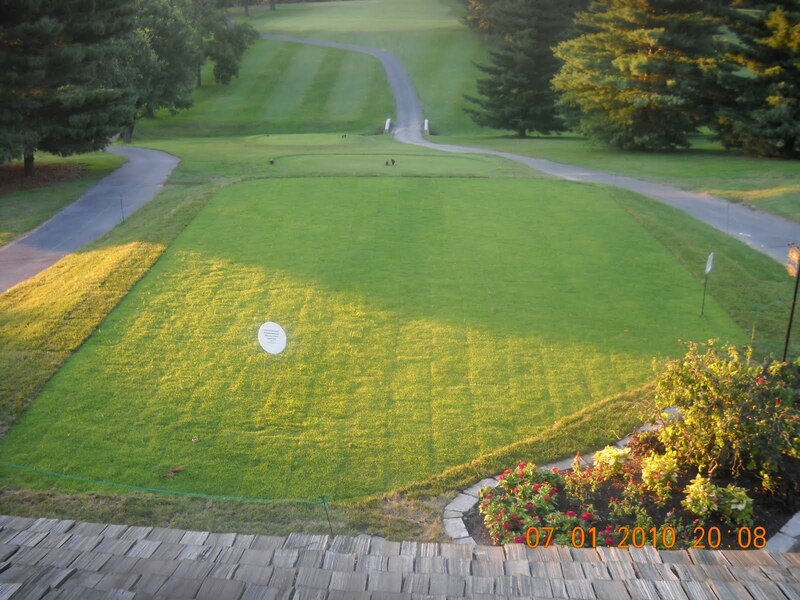 The cool season turf around the tee has been greening back up from its initial struggles when it was first laid out. It will continue to improve but will struggle during stretches of severe heat. Hand watering of the cool season surround will be required to supplement the irrigation system so we do not overload the zoysia which want to grow with less water. 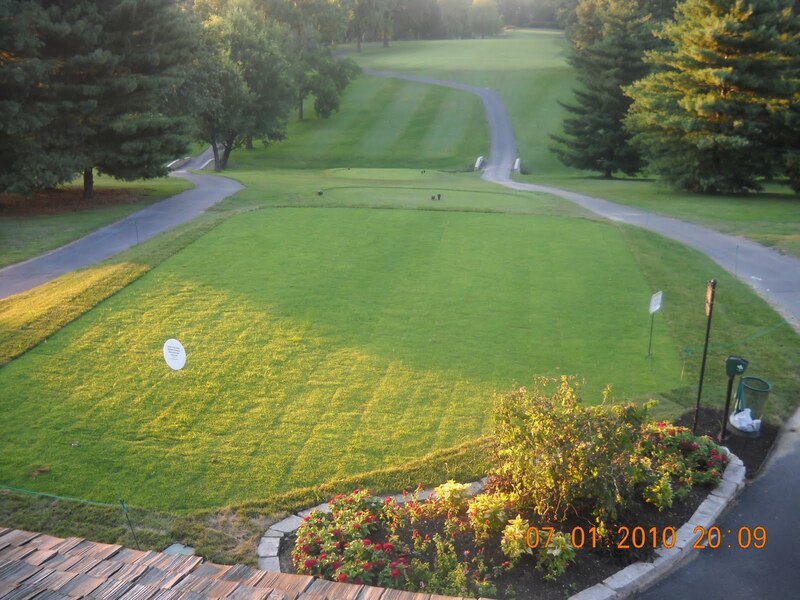 Late summer and early fall will see the surround cool season turf improve and will be in great shape for next season. We will continue to do some regular topdressing which will improve the smoothness of the playing surface and will help to provide a slight drier top surface of the tee after heavy rain events. We will also be topdressing all of our tees over the next few weeks to help with divot recovery and smooth the surfaces as well. The tees will also be core aerated which will improve rooting going into the fall and winter, provide better drainage and will improve the overall health of the zoysia. The 8th tee on the final morning of the Invitational. 32 days from the time the old sod on the tee was removed, new tee was constructed and is being mowed at normal playing height. In an effort to keep the edges of our bunkers uniform and reduce the amount of labor that it takes to manage these areas, we applied Primo plant growth regulator in a band around our bunkers. There is a slight discoloration of the turf after application but this improves within a few days. We will mix some iron in our next application to reduce the effects discoloration. 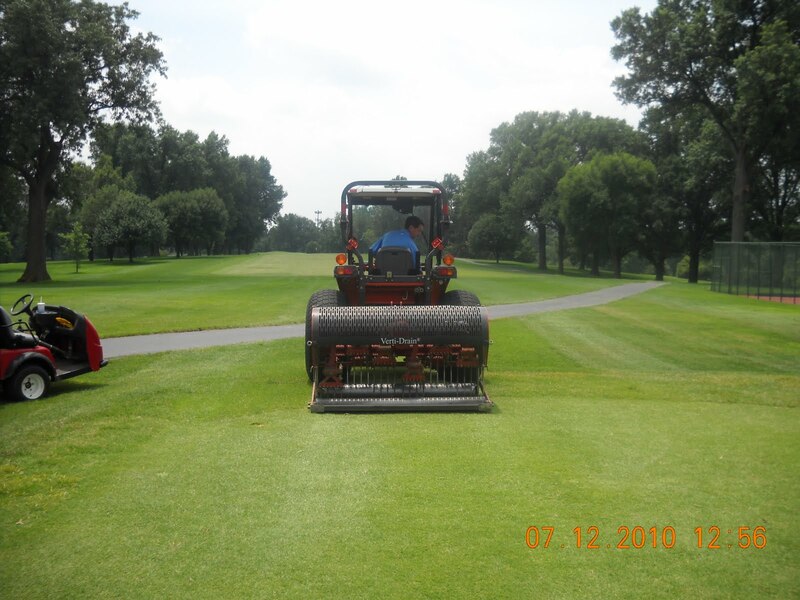 The reduction of growth is a about 50% and should last for about 3 weeks when we need to apply the material again. The camera case is on the line between the spray on the left and no spray on the right. 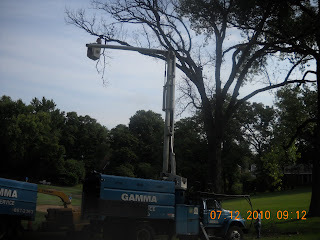 We had a dead standing oak along the fence line between the cemetery and #4 and a nice white Oak that did not leaf out this spring that needed to be removed. 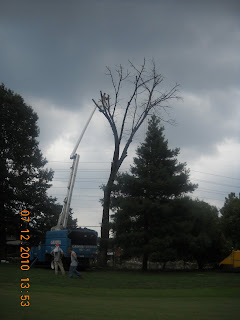 There were also a couple of larger limbs on trees that needed to be pruned for safety purposes. This work was contracted out this past Monday. 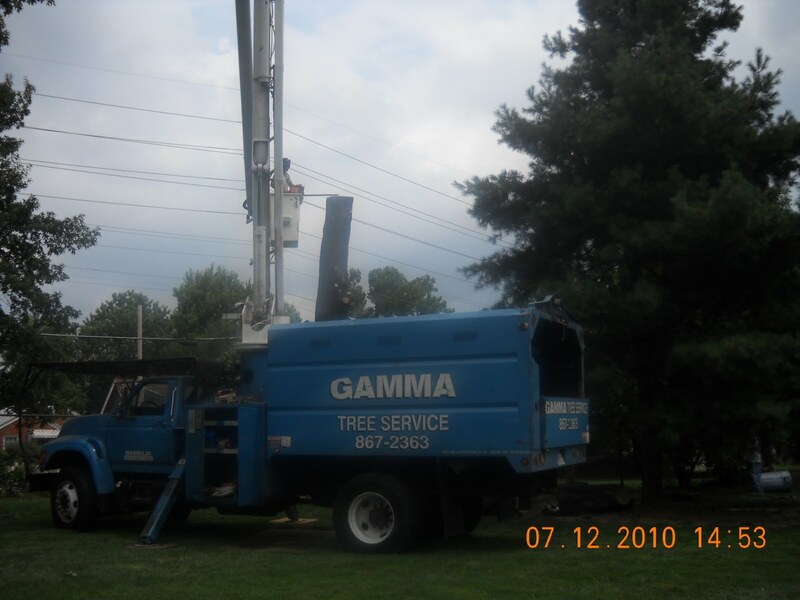 Gamma Tree Service did a majority of the work but our staff had to cut up the parts of the trees that could not be chipped and had to haul them away. Most of this wood will be used for firewood this winter. We did also remove and very diseased and dead pine tree near the 17th tee that only had a couple of green limbs still hanging on. 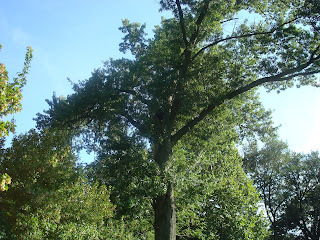 #4 oak with lift due to the large pine to the right and the fence line below. After the tree has had all the limbs removed and we are down to the main trunk. There is a 10' part of the main trunk that our staff will remove sometime next week. We have to cut the fence to be able to get at the trunk with the saw. 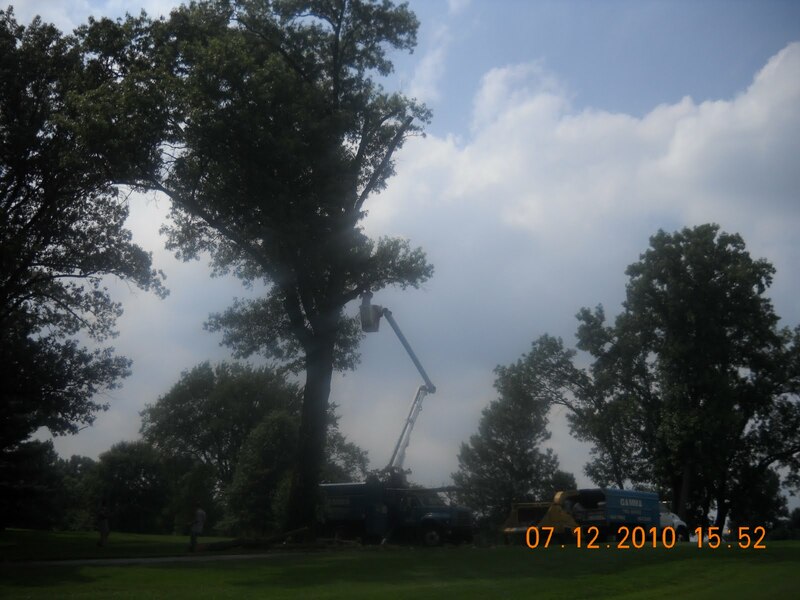 The removal of the dead white oak near #6 green. Asst. Skip working on cutting through the large trunk. Tom, Jason and Asst. Mike also were involved in finishing this work. 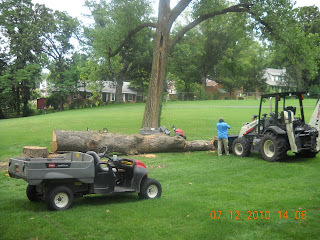 We will cut the rest of the trunk off in the next few days and will have the stump ground as our work schedules allow. Our loader had to back down our maintenance hill because of the weight of the two sections of log that we had to pick up. Gamma tree trimming a large oak next to the cart path of #11 which had some very large limbs hanging out near the path that had died. On Monday of this week, we used a solid 1/2" tine on our zoysia tees to provide some deep aerating to our tees. We were able to go about 5-6" in depth to provide moisture penetration, additional rooting and exchange oxygen into our tees which can become heavily compacted. This was a non-disruptive type operation and in most cases the holes could not be seen because of the density of the turf. We will also be doing some core aerating in the next week or two along with our fairways which begin on Monday after the Invitational. Russ using our Verti-drain 7316 to poke holes in our tees. The turf on the newly constructed 8th tee is doing very well. The cooler weather has helped the fescue recover and the rooting of both the zoysia and fescue are tacking down to the soil. We will be doing a walk mowing of the tee surface in the next few days as the turf continues to improve. 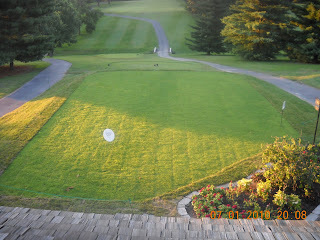 We added another 24 pieces of fescue to the front of the tee to finish off the surround. We have some asphalt patch work to complete in a couple of spots and everything should then be complete. Here are a couple of pictures from the top of the Halfway House which gives a better perspective of the tee and how it now fits into the landscape. 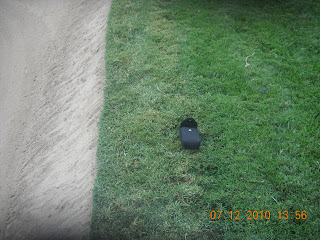 Parts of the 4th, 6th and 12th blue tees were repaired a few weeks ago with some new zoysia sod. They were top dressed heavily this evening and broomed in to smooth out the heavy application of sand. I expect these sections of tee to be played in the next few days. We appreciate your patience. Also, the short range zoysia tee was verticut at about 1/2"(You cannot see the verticutting lines after the topdressing and dragging of the sand) in depth today in two different directions to begin the process of taking some of the humps that natural form from topdressing divots and play over the last few years. The tee was sanded very heavily and fertilized. I left the right third of the tee with a little less sand so that it would be in play but the left two thirds will need a few days of watering and growing before we place it back in play. 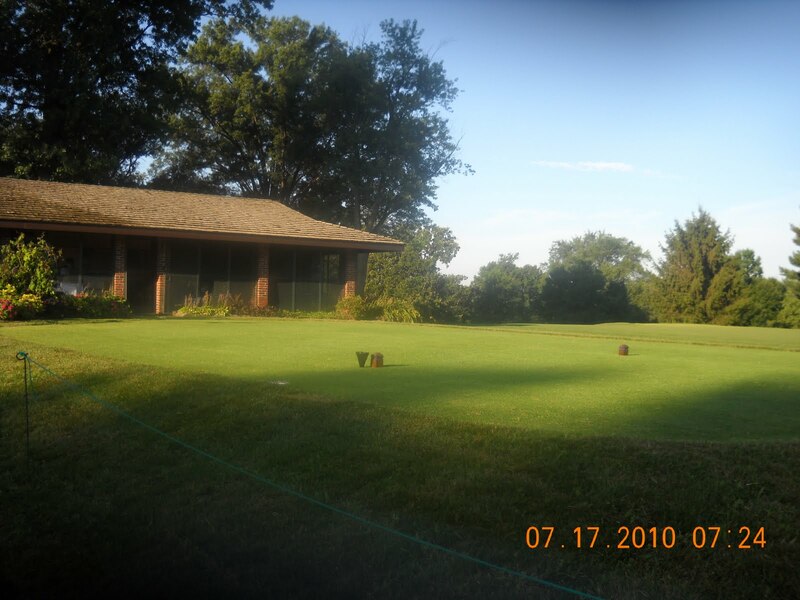 In the end, practice tees need to have the sod removed and the teeing surface leveled every few years to provide a completely level surface. We made our 2nd needle tining/venting of our greens this week. It was great timing to vent our greens during this week of cooler weather. The last few weeks have been a little stressful for our greens with the high heat and humidity. 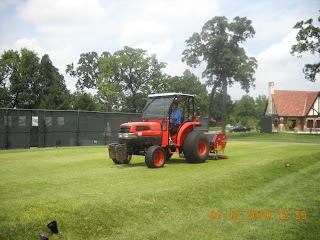 Here is the link to the last post regarding our needle tining and what we hope to achieve using this process. Our next venting will be toward the end of the month after the Invitational. Assistant Skip got the honors of riding the tractor for about 2 days of needle tining work. 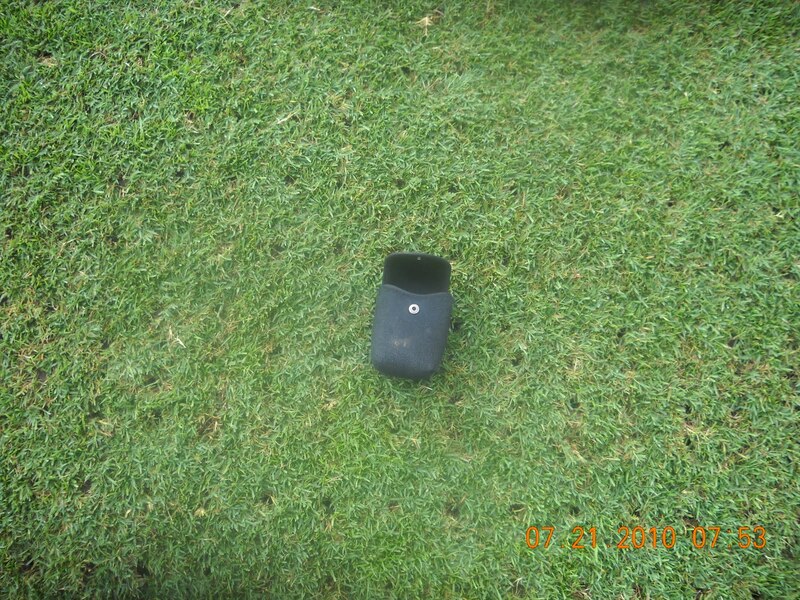 The verti-drain aerator doing its work. A very non-disruptive practice but very beneficial for our turf. The holes might be visible for an extra day or two during the more stressful times of the summer but we try to reduce impacts on putting quality by rolling the greens after the venting process which helps to smooth any imperfections caused by the work.